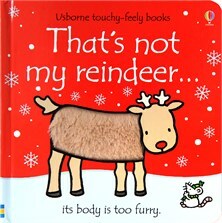 Very young children will delight in meeting the soft and furry reindeer in this colourful touchy-feely book. With simple, repetitive text on every page, children will enjoy joining in and exploring the textures, including a fuzzy neck, velvety ears and a hairy tail. A fantastic first Christmas present that will help very young children develop language and sensory skills. Babies and toddlers can share the anticipation of Christmas with this festive board book's bright pictures and patches of different textures. Little Mouse features on each page - a charming cold weather role-model in his warm scarf and pom-pom hat.